The PolyLevel® System utilizes a high-strength polyurethane mixture that expands to fill voids under concrete, stabilize soil, and lift concrete. With multiple formulas available, PolyLevel® is able to fit the needs of any commercial, industrial, or municipal job, large or small. Midwest Basement Systems is Greater Des Moines' experienced concrete leveling contractor and PolyLevel® dealer. Schedule your consultation with one of our commercial technicians today to learn how we can lift your sunken concrete slab using our fast, durable, cost-effective solution. Before PolyLevel: Roadways frequently sink and crack over time. 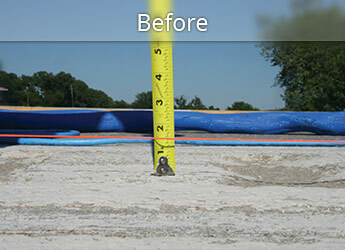 After PolyLevel: PolyLevel® foam can quickly and permanently level roadways. 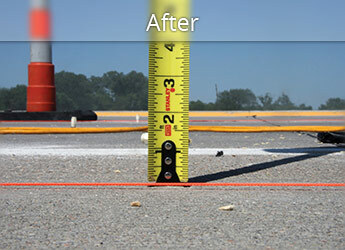 See how PolyLevel® works to lift settled, damaged concrete slabs. Concrete raising for roads, bridges, highways, railroads & runways. Serious safety hazards occur when these concrete elements sink, so repairs must be made right away. Midwest Basement Systems often relies on polymer injection or polyurethane concrete lifting to raise sunken concrete roads and runways. The main advantage of this technique is that the injected polymer cures to about 90 percent of its final strength within an hour after injection, enabling the road or runway to be used quickly. Rescuing a sinking in-ground pool. The combined weight of concrete and water can sometimes be too much for the underlying soil to bear. When this happens, an in-ground pool can begin to sink down. Midwest Basement Systems can solve this problem by injecting an expanding polymer compound beneath the pool. The polymer’s expanding force can raise up the sunken pool, while also improving the load-bearing qualities of the soil. Midwest Basement Systems are your local experts for all commercial concrete lifting and leveling services. We provide free estimates on all our work, so call us today to find out how PolyLevel® can solve your concrete repair problem. We proudly service Waterloo, Ames, Des Moines, Marshalltown, West Des Moines, Ankeny, Urbandale, Fort Dodge, Mason City, Cedar Falls and throughout the surrounding areas.